So the title of this blog post is a little misleading, since the photo shown is still of the front facade of the Haunted Mansion during the holiday season. 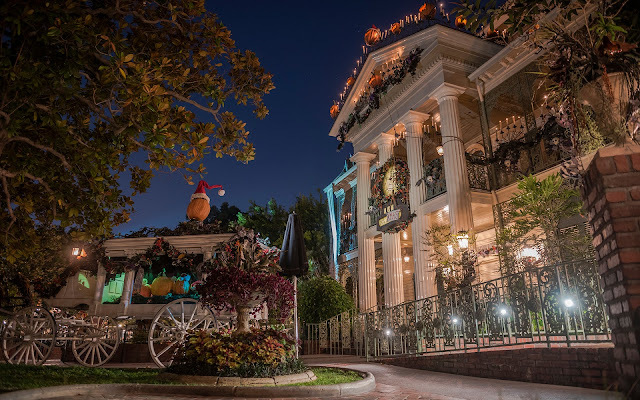 But it's taken from a sort of rear point of view, in that it's opposite the direction that guests approach the mansion from the start of the queue, and it's most definitely the opposite side of the hearse being viewed. Even the pumpkins within and on top are facing the other way. So in retrospect, I suppose I should have called this blog post the "Backside of Hearse." Or at least of Pumpkin! The Haunted Mansion Holiday after hours.